Frequent Calibration is Key Frequent calibration of gas sensors is key to maintaining the accuracy and performance of the device. Both CO2 and CO sensors can exhibit tendencies to drift over time due to environmental factors such as temperature, humidity, and pressure. 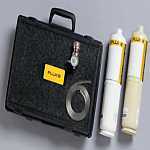 Fluke recommends monthly calibration of the CO sensor, and an annual calibration for CO2 for optimum performance.